"Oh, some of these fridge-chilled whole-leaf teas are exquisite and an entirely different beverage from the stuff in the bottles at the stores. What irritates me most is when a “fine” restaurant or sushi bar serves the stuff in the cans. Why can’t a restaurant chill-brew some whole leaves? That canned or bottled stuff has such a funky aftertaste; I think it picks up some of the flavor of the metal in the can as well as any additives as you mentioned. I have fridge chilled the two Baozhongs -- 4 and 50 year bushes -- side-by-side. The color of the liquor is very similar; the 50-year brew has a slight tinge of amber while the 4-year bush is light green. Still, they look quite similar in the glass jars. They are both fragrant. The 4-year is a little crisper and lighter; I like it! 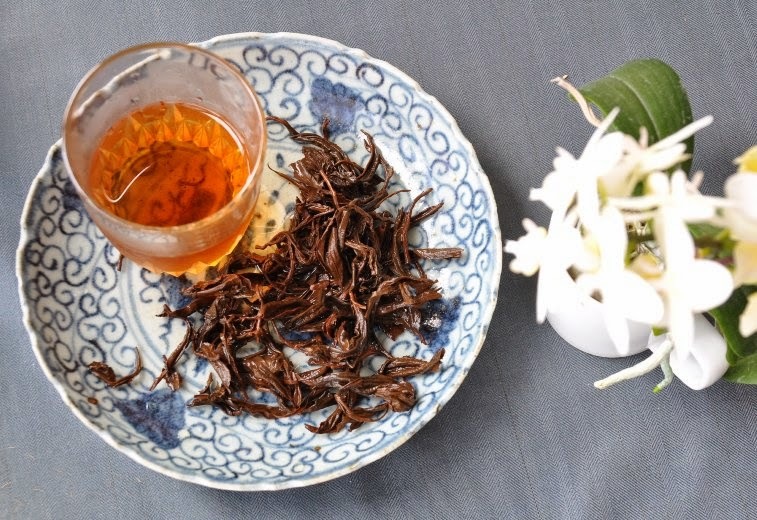 The 50-year is richer and has a little more astringency; it is, however, quite fragrant with that Baozhong perfume. There is not a huge difference in their chilled forms, but I like the freshness and immaturity of the 4-year. It is almost naïve; it has not yet learned to be a full-blown, grown-up Baozhong! It is very refreshing in its youth!" Dear Amy, thanks a lot for sharing your experience. 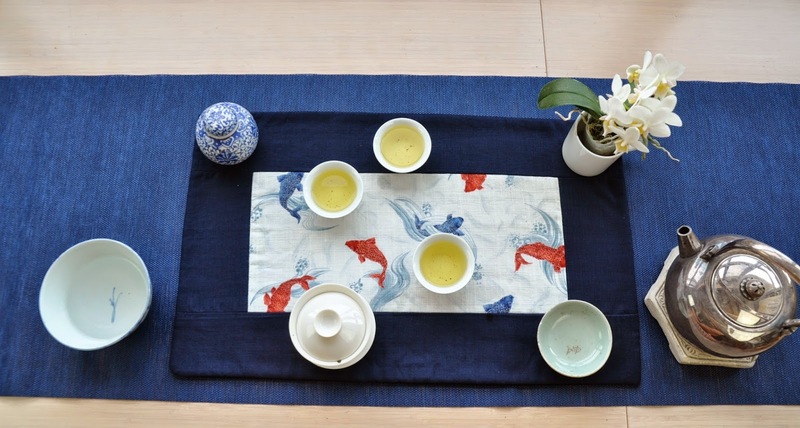 In a hot place like Southern California, it makes a lot of sense to use Baozhong or High mountain Oolong (or any low oxidation, low roast tea) as iced tea, because such teas have a cooling, fresh character. In Taiwan, there are also lots of similar cold teas sold in stores. The problem with these beverages is that they are like a photoshopped picture of an actress: the sweet taste is faked with (lots of) sugar, the color is stabilized with preservatives and the scents are enhanced with the (chemical) flavor of the day. Using whole leaves tea to prepare your own iced tea is so much more natural! 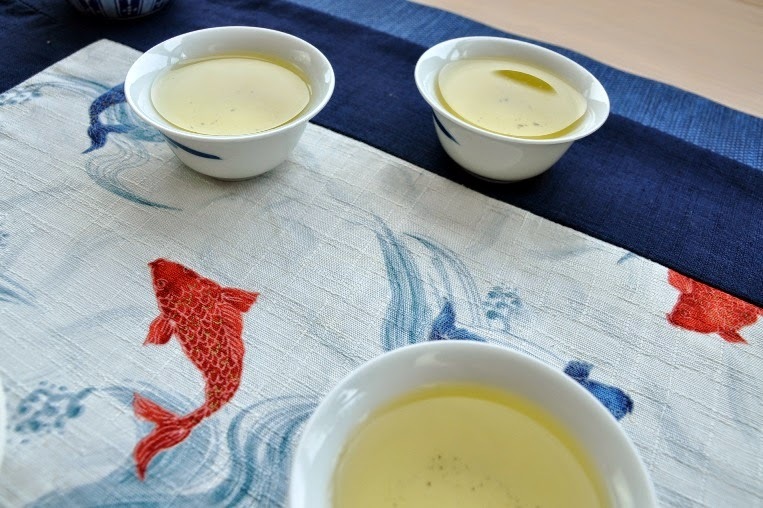 For light fresh teas (like green tea or high mountain oolong), beverage makers add quite a lot of flavors, because such teas have very subtle scents that often get weak when they get cold. This is especially true for the cheapest teas. And if your palate is accustomed to industrial food, such natural iced tea might feel too light in terms of taste and scent. 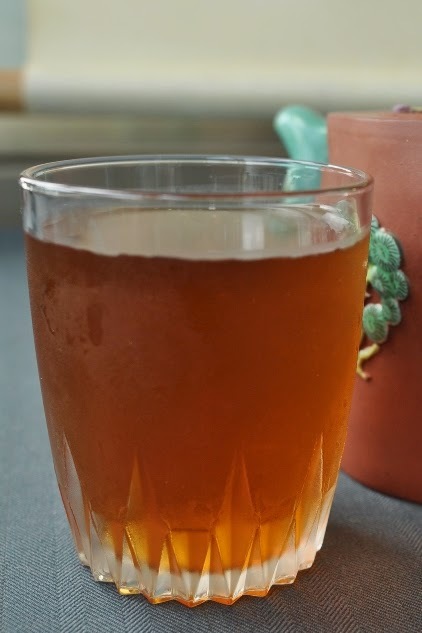 Since the cold temperature reduces the flavors of the natural iced tea, I generally recommend using teas with higher oxidation and/or roasting. Pictured here, for instance, is a iced tea made with an organic red tea from the East Coast of Taiwan. How is it best prepared? 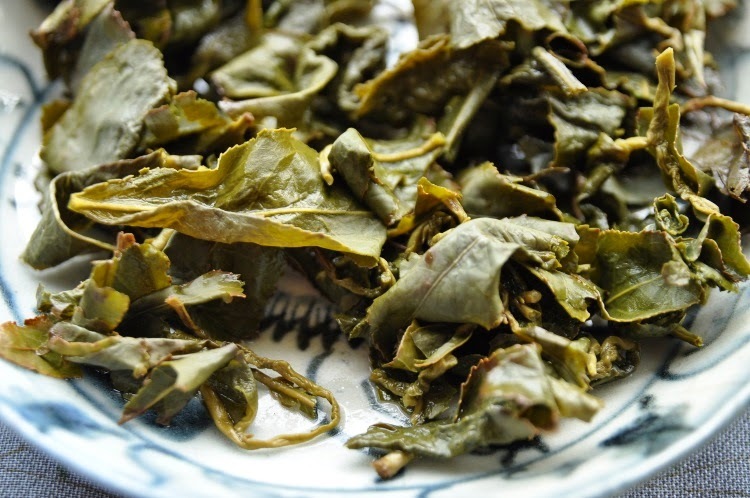 Since we are going good quality tea, we want to extract most of the flavors from the leaves. That's why the leaves have to be properly brewed in a big teapot (= preheating + boiling water). If you were to use cold water and long cold extraction, such method would only release a small portion of the flavors in the leaves. This method is sometimes recommended for lower quality teas. But if you're using good tea, this is a waste. Iced tea is made primarily to quench thirst. That's why we use a big teapot to prepare it. If you have time, you can do multiple brews of the same leaves in a big teapot and empty each brew in an even bigger jug. When I don't have much time, I brew directly in the preheated glass jug. A layer of leaves on the bottom is generally enough. When the tea's color has achieved the concentration you wish, you can remove the leaves. 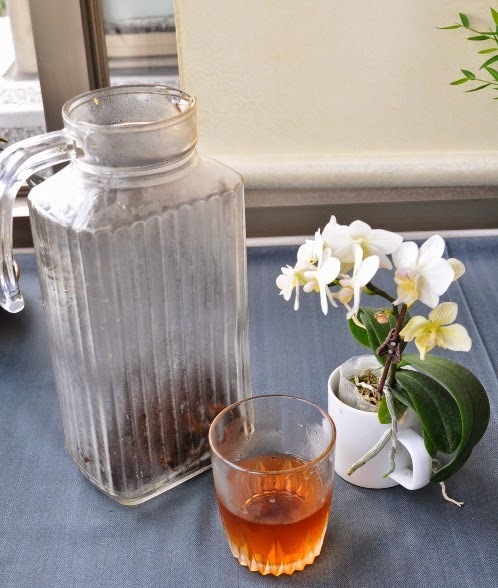 (Slowly empty the tea in another jug/bottle: the leaves will remain on the bottom of your jug). The tea then needs to cool down slowly to room temperature and then we can put it in the fridge. Iced tea is a nice way to experience the cool side of your leaves. The scent will never be as powerful as a flavored beverage, but what I like most is the light and clean taste of real iced tea. Then comes an added bonus: a long and delicate aftertaste! You get it even with iced tea! 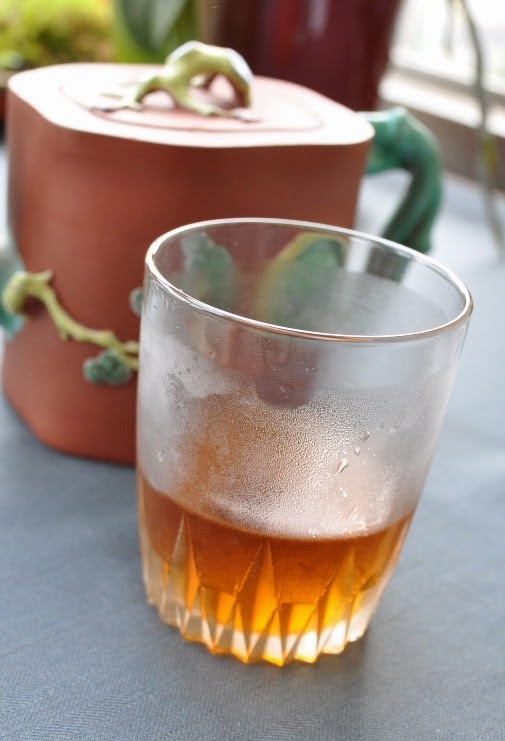 And if you have kids or friends who don't often drink gongfu tea, home made iced tea is a very nice way to introduce them to the real taste of quality tea!